Hello MFT fans! Amy here. 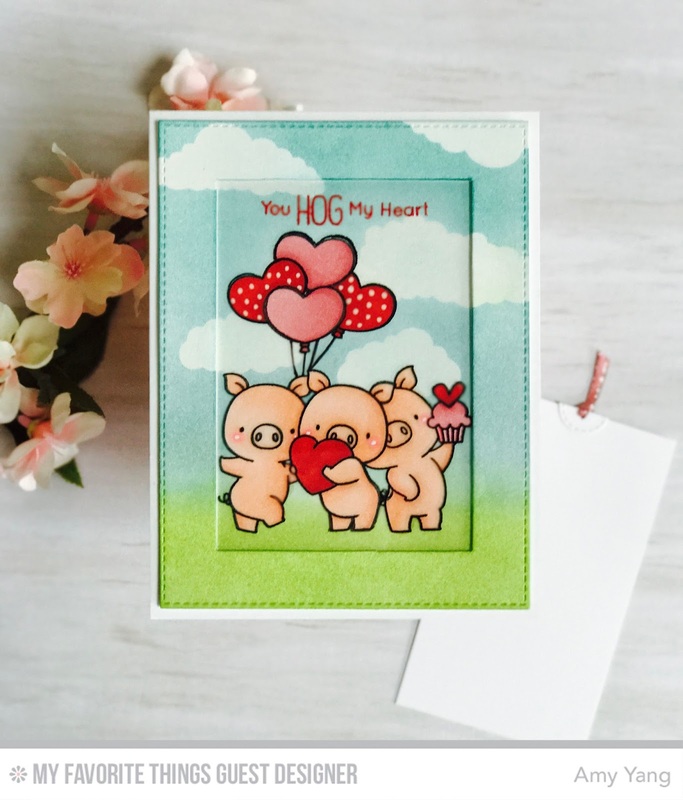 Valentine's Day is around the corner, and I'm happy to share my three love themed cards with you. 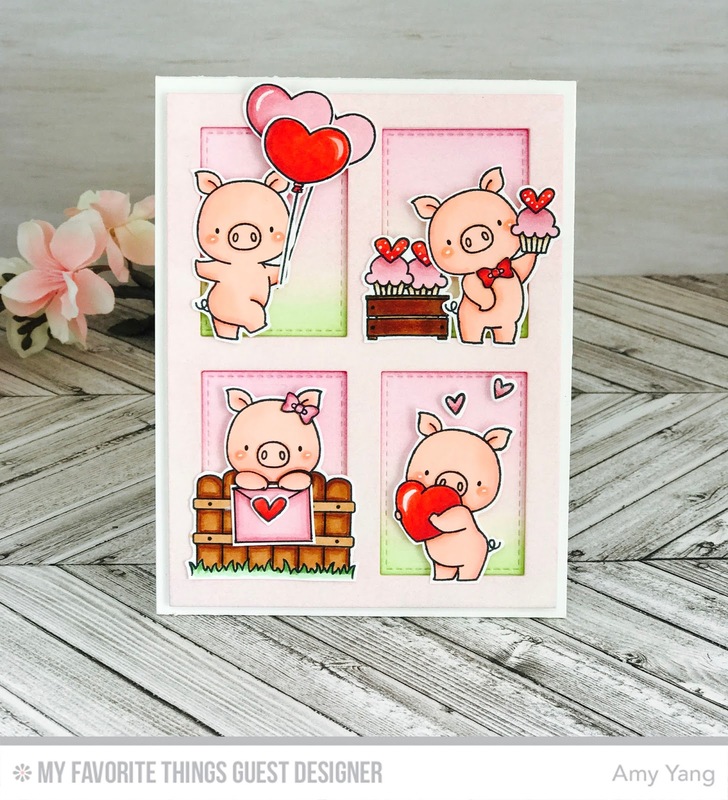 Today, I'm showcasing the super cute Hog Heaven stamp set along with some of my favorite Die-namics. My first card is a fun magic slider. I started by diecutting two Bristol paper with Die-namics Blueprints 28 (one for the main card panel and the other to build the hidden channel inside). With the paper trimmer, I removed the inner flap and the semi circle notch on both papers. Then I trimmed down another Bristol paper and acetate to 4"x 5 1/4. At this point, I had to decide whether to make a simple scene that didn't require a masking technique or complicated one that did. I wanted to challenge myself so I created a scene that took some time and effort. I stamped all the images I used on the card on Inkadinkado masking paper and fussy cut them. I also decided to add clouds to the background so I die cut the masking paper with the Die-namics in the Clouds. 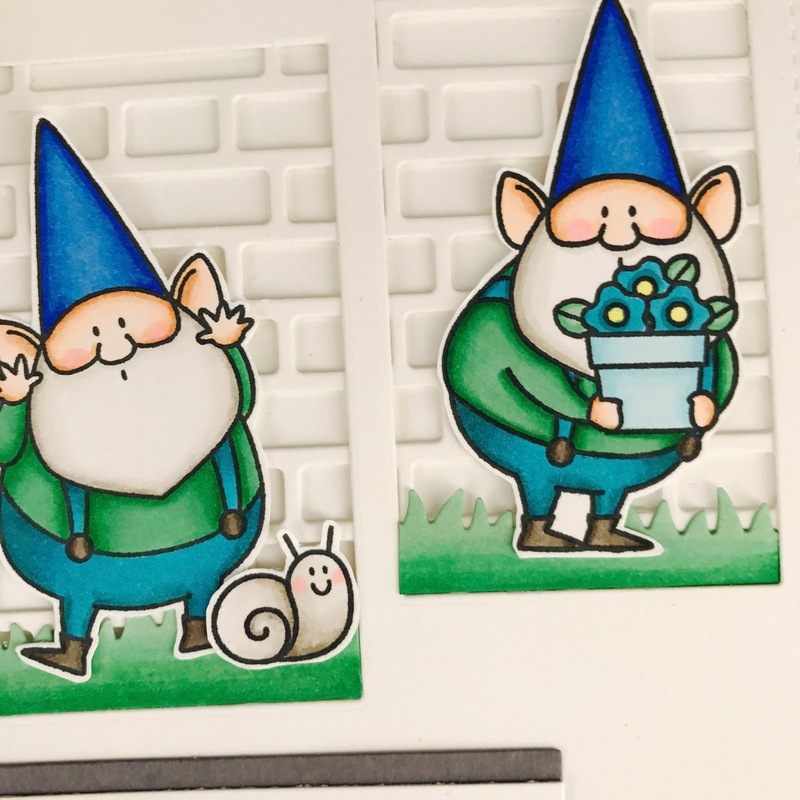 Using the Misti stamping tool I laid my trimmed paper to one corner and stamped my images. 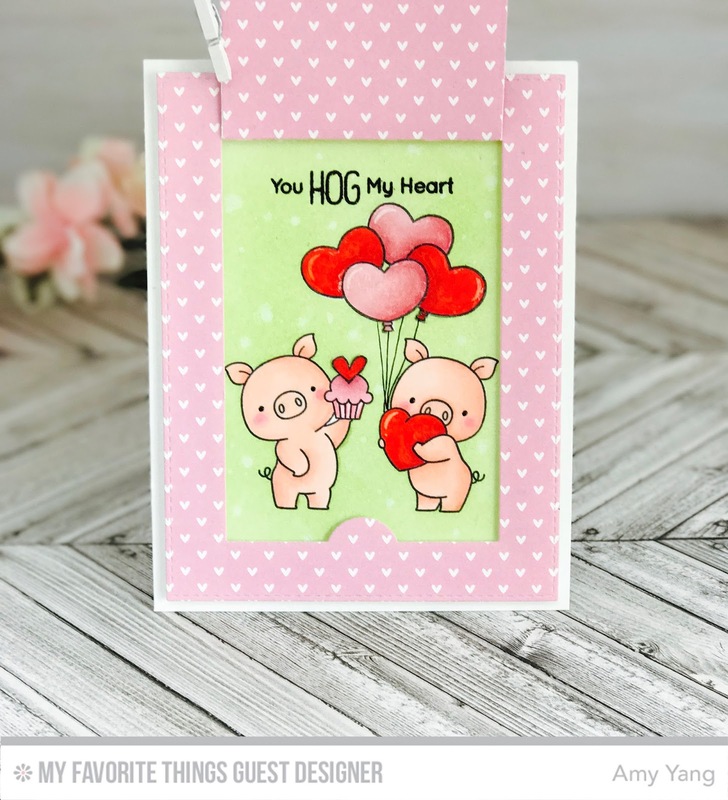 I stamped the hog with the heart first using Hybrid ink pad in Black Licorice and then I laid the acetate carefully on top of the paper and stamped the hog, this time using Stazon ink. 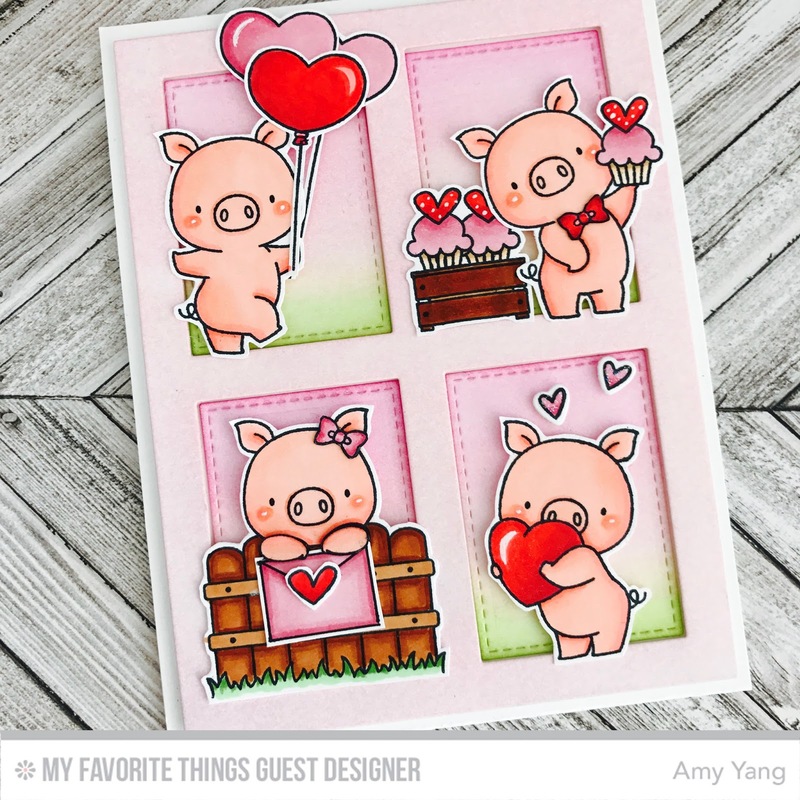 After, I removed the acetate from the Misti stamping tool I masked the hog with the heart and stamped the other two hogs. Please note: I changed the cupcakes by removing the cherry on top with masking tape and stamped the hearts from Sweet Succulents instead ( I did this to all the cupcakes on my cards). I followed the same steps as before making sure to mask the acetate as well. The same process was used for the heart balloon from Adorable Elephants stamp set. For the string on the balloons I drew the lines in with a thin sharpie on the paper as well the acetate, making sure to line them up together carefully. After the ink was fully dried, I colored the images with copic markers. To create the background, I placed the main card panel on top of the trimmed paper with the colored images. I covered the images with masking paper that was fussy cut before. I also adhered the clouds that were cut in masking paper. 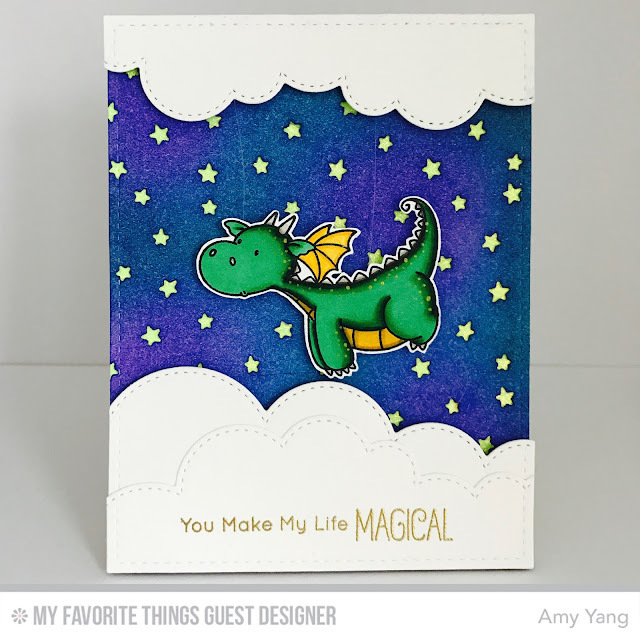 Using the blending tool, I applied Distress Ink in Twisted Citron on the bottom and blended my way to the top of the card using Stormy Skies. Afterwards, I removed the cloud masking papers and went over it lightly with Stormy Skies ink. When everything was completely dried, I stamped the sentiment using Versamark Ink and heat embossed it red. To assemble the card I adhered the trimmed paper with the colored images to the card base. On top of that, I adhered the channel that was cut previously with the blueprint 28. Before adhering the channel that will be hidden, I made sure to trim a little off all the sides and remove the top strip to create a rectangle U shape. This allows for the white card stock that I trimmed to 4 3/4 x 2 3/4 to slide in and out of the card, revealing or hiding the colored images. I was very happy with the way the card turned out and I think it was time well spent. I hope you like it too. My next card was very simple to make (at least compared to my previous card) but I think it still makes a cute Valentine's day card. First, I used my paper trimmer to cut Bristol paper down to 4"x 5 1/4. 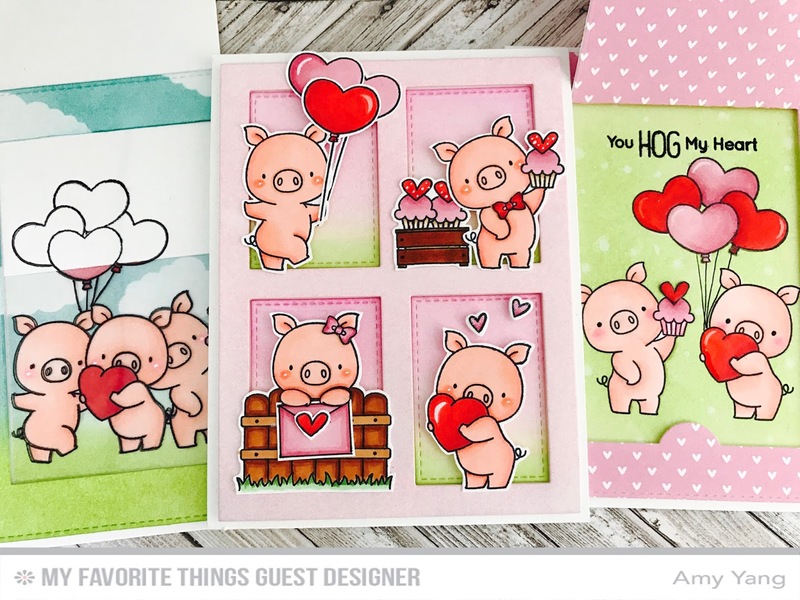 I stamped my images from the Hog Heaven stamp set using the Hybrid ink pad in Black Licorice. I used the masking technique for the balloons and the little heart on the cupcake. When the ink was fully dried I colored the images with copic markers. I added the sentiment using Versamark Ink and heat embossed it black. Then, I covered all the images with the masking paper I used with my previous card. With a blending tool, I applied Distress Ink in Twisted Citron to the paper. Next, I added droplets of water to the background. When dried, I removed the masking paper and adhered it to the card base. Lastly, I added Glossy Accents to the all the hearts for shine and dimension. For the front panel I used the Die-namics Blueprints 28 and die cut 2 pink paper with white hearts from the Lucky Prints Paper Pack. On one of the die cuts, I added double sided foam tape around the edges and adhered it to the back panel. I didn't want the inside of the flap to be white so I took the other die cut paper and trimmed off the flap and adhered it to the white flap. I kept the front of the card as is because I thought the patterned paper was more than enough. I just adore the peek a boo aspect of this card. My last card is one of my favorite styles to make. 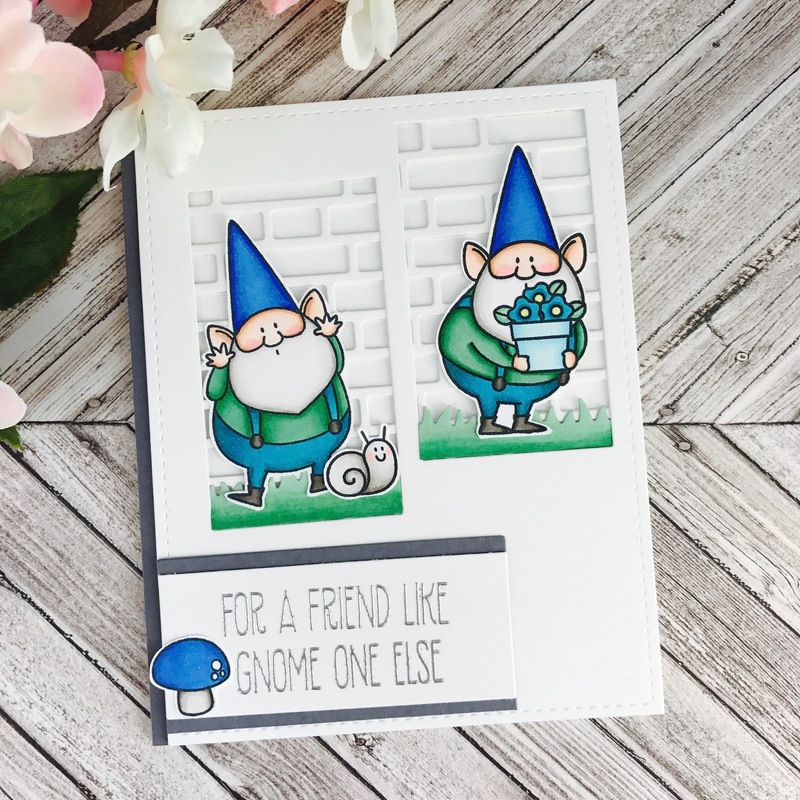 I love to create little scenes in each rectangle and lots of MFT stamp sets are perfect for that. 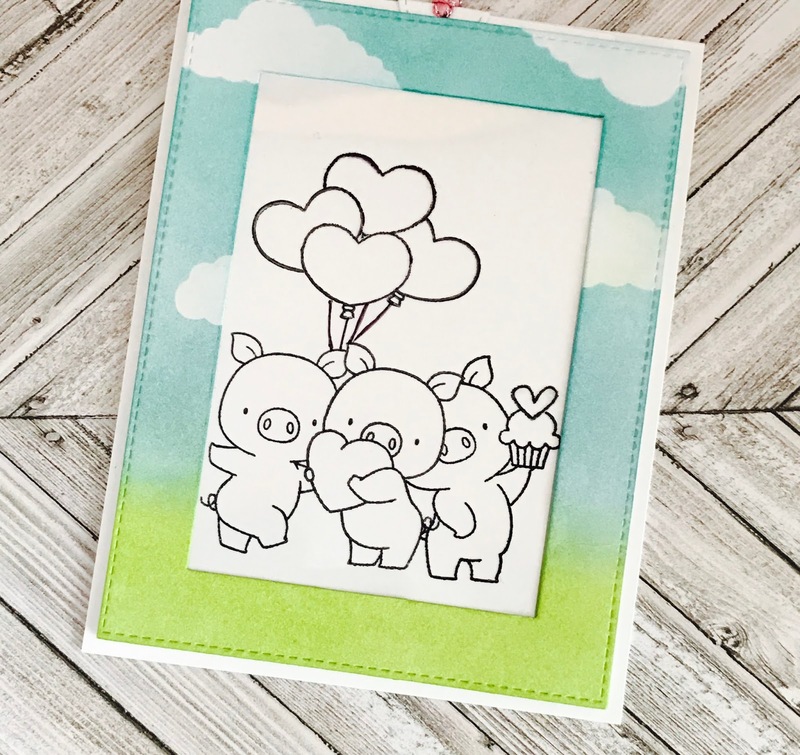 I stamped the images from Hog Heaven and the heart balloons from Adorable Elephants using Hybrid inkpad in Black Licorice on white cardstock . Note: Beside giving the cupcakes hearts again I used the masking technique to put the two cupcakes inside the wooden trough. In addition, I drew a little envelope for the bottom left hog to hold. Using the Die-namics Gift Box cover up ( in my opinion a must have) I die cut Bristol paper. Whenever I'm working with distress inks, I prefer to use Bristol papers because the inks go on very smoothly. I applied Spun Sugar distress ink to the main frame, added foam tape around the borders and adhered it to the card base. Then, I took the four stitched rectangles and applied Citrus Citron, Spun Sugar and Picked Raspberry. Next, I placed them inside the main frame. I used foam tape behind the colored images and adhered them inside each rectangle to create my little scenes. 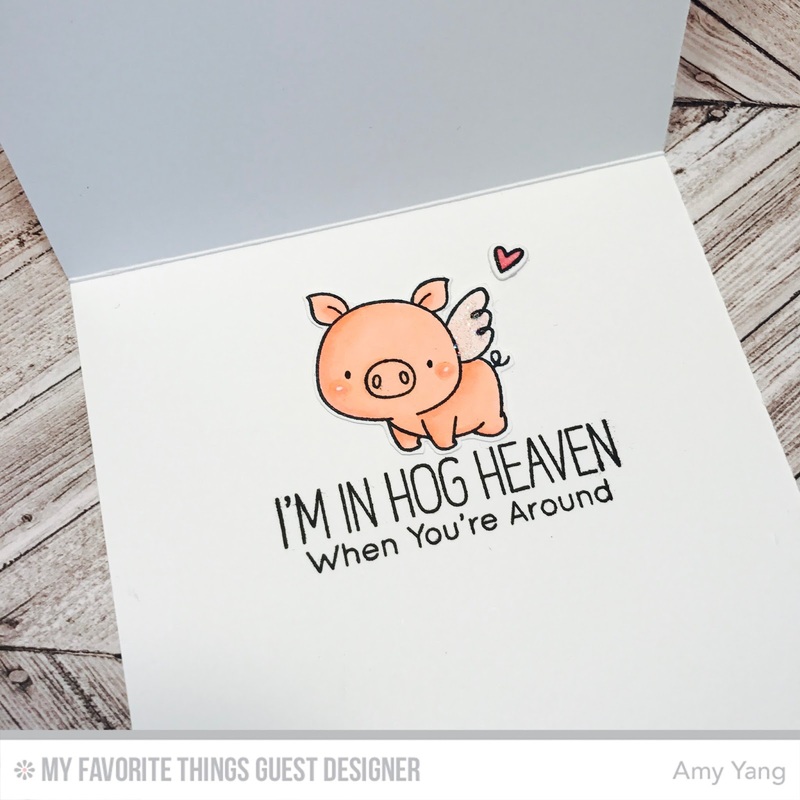 I placed the sentiment inside the card with the little hog angel. I couldn't leave him out of the card; he was too adorable. Thank you once again to the MFT team for this wonderful opportunity to share my cards here. I hope to see you on the MFT Facebook page and on Instagram. Thanks for stopping by, and have a fabulous and (hopefully) crafty day!!! Hello there! 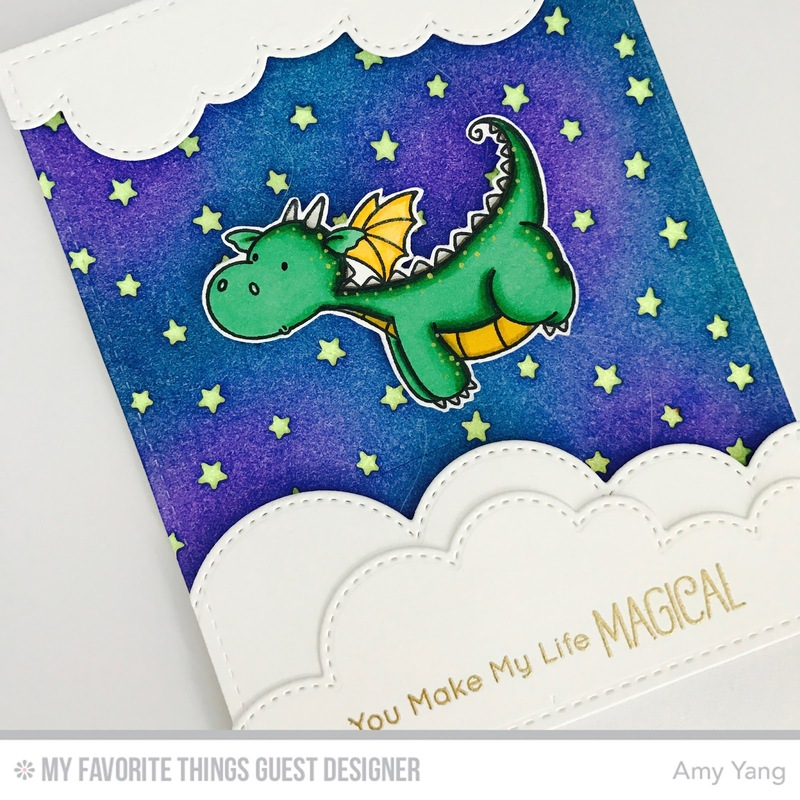 Today I'm sharing a card I made inspired by the MFT sketch challenge 317 and MFT color challenge 62. 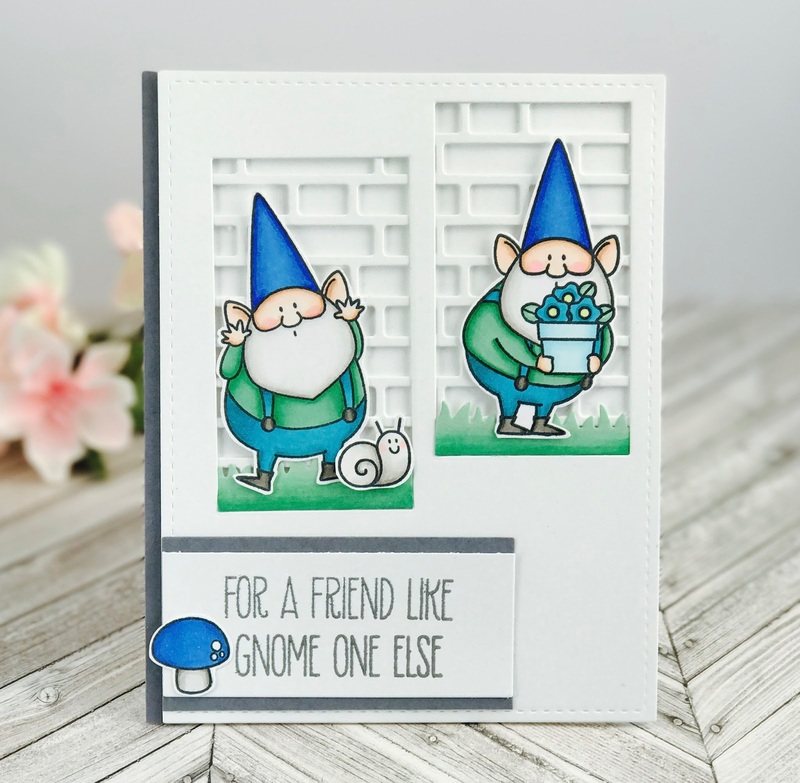 For this card I used the You Gnome Me stamp set. It's an older release that I bought recently and I couldn't wait to play with it. 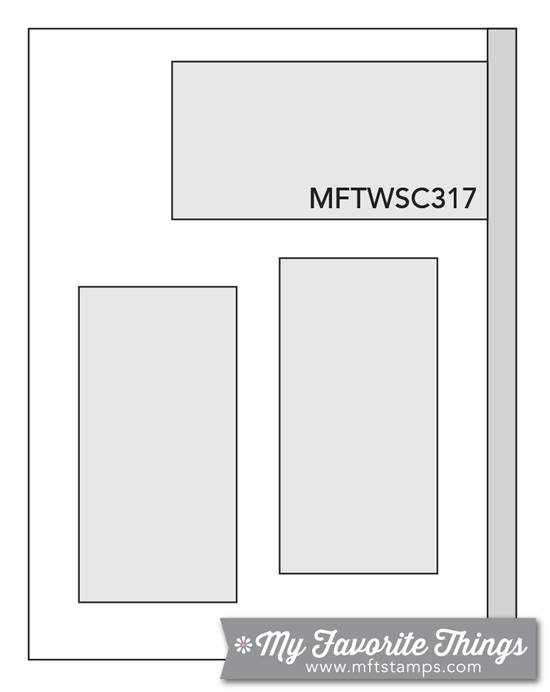 To create my panels, I die cut the Die-namics brick wall cover up, and the large stitched rectangle from Die-namics blueprints 3. 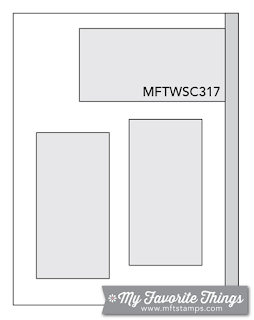 You can tell from the pictures that I also used a small rectangle to cut out two areas in my front panel. Next, I took the die cut brick wall and adhered it behind the main panel. This allowed the brick wall to show through the open areas and added some texture to the background. I also used the Die-namics grassy hills to die cut white cardstock and colored it with copic markers. Then, I trimmed the card base to be slightly larger than the main frame, added a thin strip of cardstock to the left side and I adhered the front panel to the card base. To add my sentiment, I used a small rectangle white card stock and heat embossed the sentiment with silver power. I added a slightly larger gray card stock behind the sentiment and adhered that to the main panel. To finish, I added the colored images and the grass to the front of the card. Hello crafty friends! 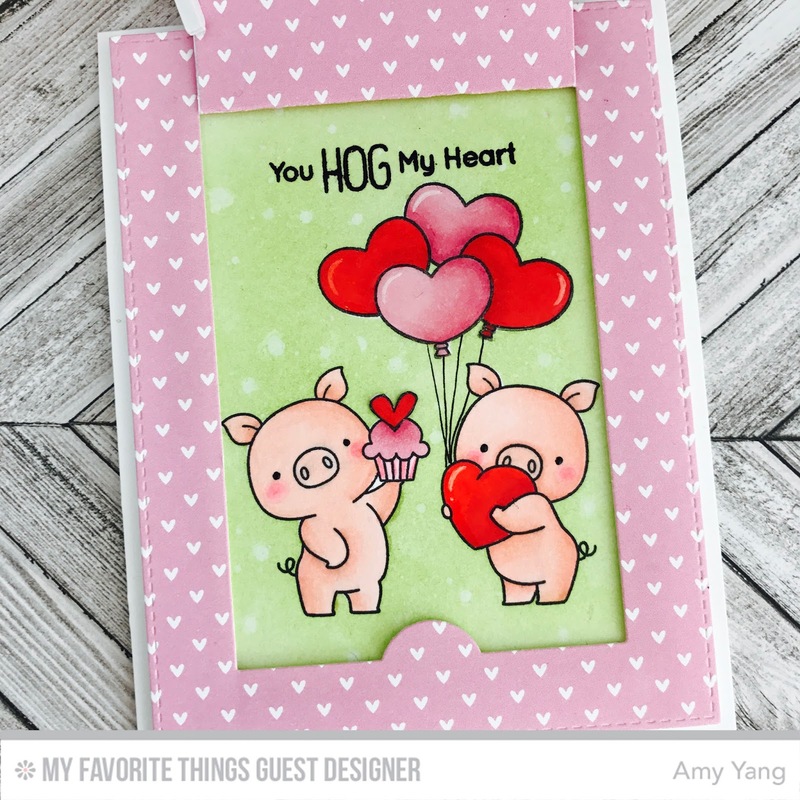 Today I have a fun light up Valentine's Day card to share with you using products from My Favorite Things . 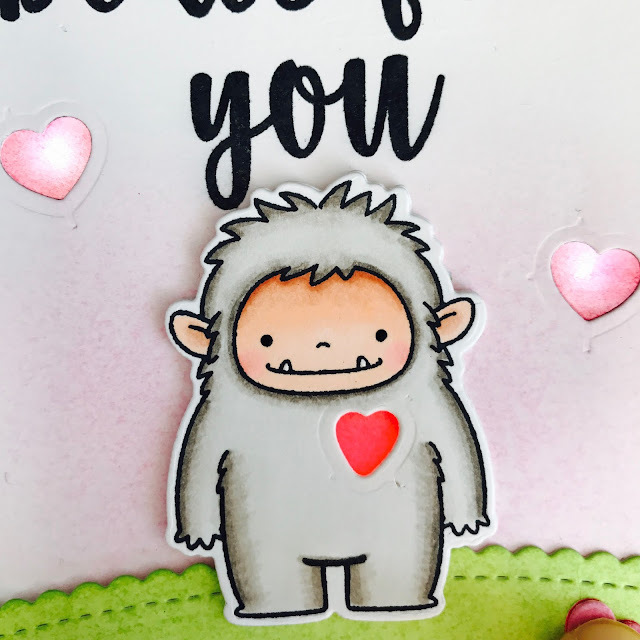 First, I stamped and colored (copics) the Yeti from the Beast Friends stampset. 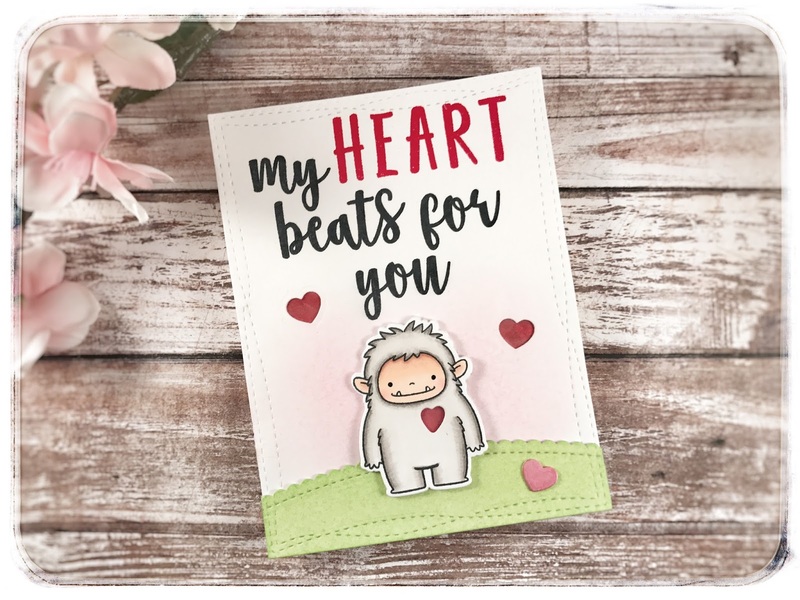 Then, I used the coordinating Die-namics for the Yeti and the heart you see on his chest. Next, I used the largest wonky-stitched-rectangle-stax to trim three pieces of white cardstock. 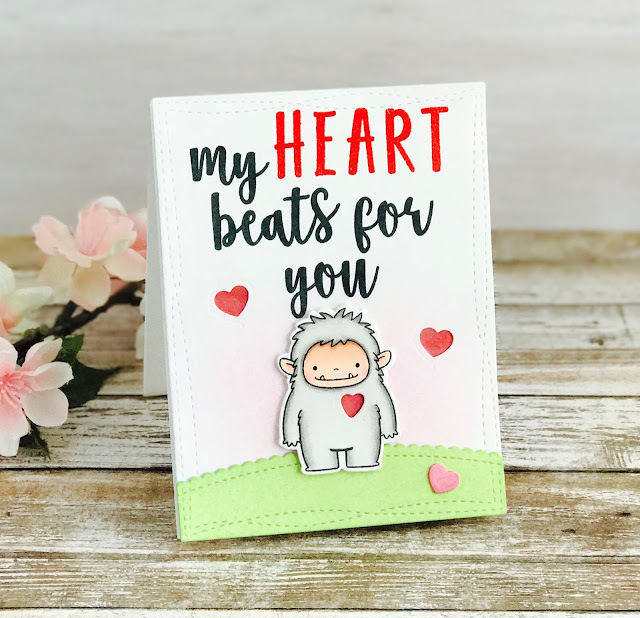 With the first cardstock I added my own sentiment using well-connected-alphabet , I cap all the letters of the word HEART and heat embossed it in red to bring more focus to the word. I applied spun sugar distress ink to the background and die cut three hearts (for the lights to go through). 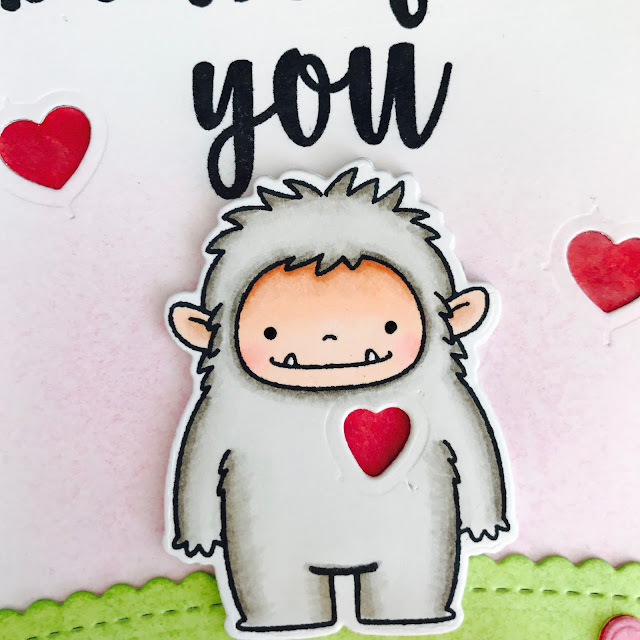 With the second trimmed cardstock I used one of the stitched-pierced/die-namics-stitched-scallop-basic-edges to create the gound for the Yeti to stand on and used twisted citron distress ink to add color. To finish my front panel I added red colored vellum paper behind the diecut hearts. With the third trimed cardstock I added the lighting element. Using the chibi-lights starter kit, I followed the direction from the booklet. I added two white lights and one red. The red light I placed behind the Yeti. Then, I added THREE LAYERS of double sided foam tape to control turning on and off the lights. If you use only two layers of foam tape the lights will stay on. To keep the lights off you need to insert a piece of paper to prevent the copper tape from touching the battery. For this card I wanted the effect of heart beating so I added three layers. 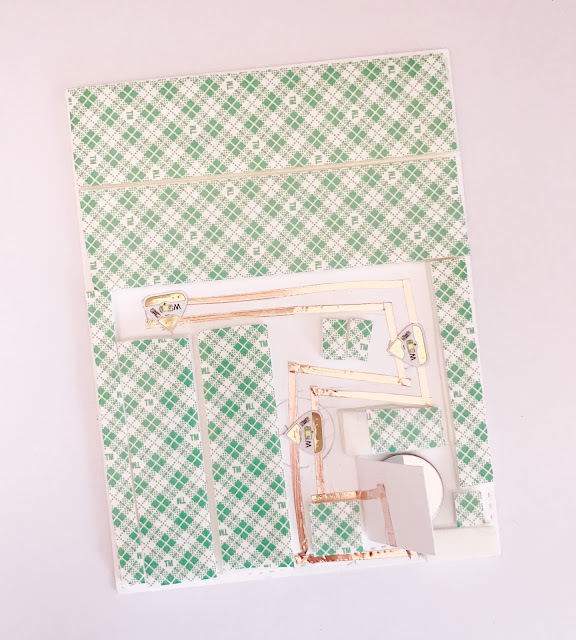 This project might seem complicated but it was really quite simple to make. Lastly, I adhered the front panel to the the second layer and added it to the card base. Hello friends! Words can't describe how elated I am to be a guest designer for My Favorite Things this month. Thank you so much MFT team for this awesome opportunity! 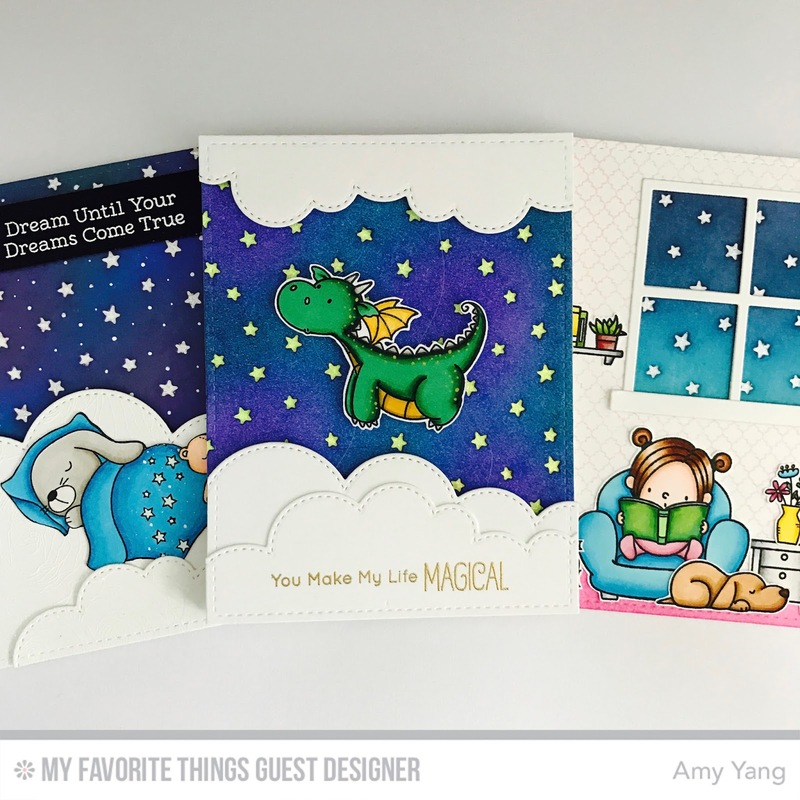 Today I have three cards to share with you that was inspired by the Die-namics Stars in the Sky -Horizontal. For the first card, I used the BB-Magical-Dragons. I just love this stamp set. I wanted to create a scene with the dragon flying through a starry sky. Here is how I create this fun interactive card. First, I stamped the dragon using Black Licorice Hybrid Ink and colored it with copic markers. 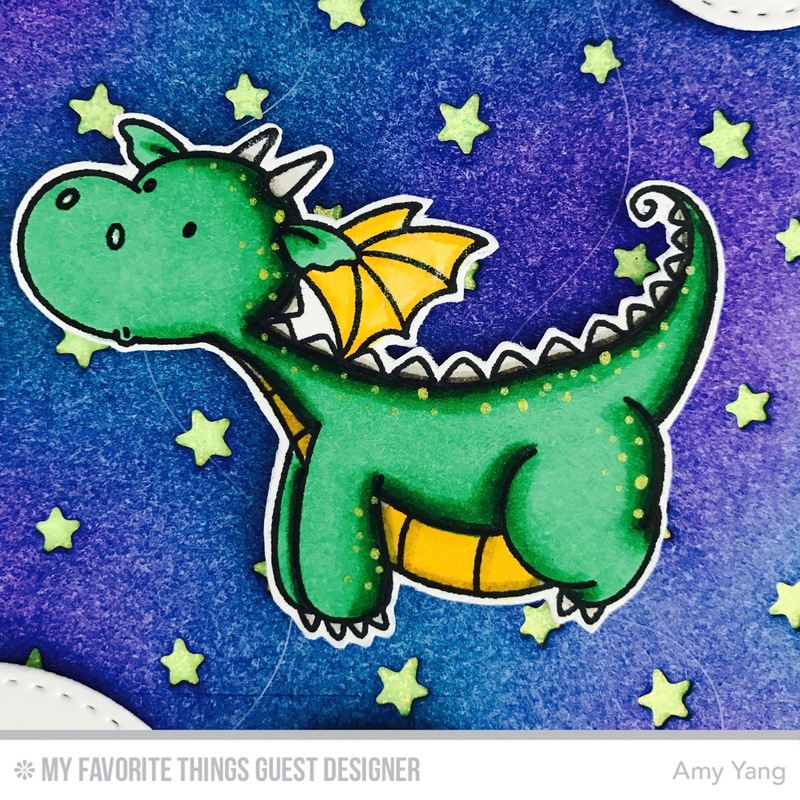 I added some dots on the dragon with yellow Gelly Roll pen to add more interest. To create my front panel, I used the largest Die-namics Stitched Rectangle to die cut bristol paper and inked the background with distress inks in wilted violet, blueprint sketch, and chipped sapphire. After, I used the Die-namics Stars in the Sky -Horizontal and die cut it so it covered the whole front panel with stars. Then, I used the Stitched Rectangle again to die cut white cardstock (to be used for the clouds) and gold glitter paper. I glued the gold glitter paper behind the front panel. This created really shimmery and sparkly stars. Next, I used the Die-namics Stitched Cloud Edges and die cut three clouds. I used one of them to add the sentiment using gold embossing powder. I I flipped the other two clouds and laid them on the front panel in preparation for attaching strings. I laid one cloud on top, and the other on the bottom with the dragon in the middle. Then I taped an invisible string loosely going down from the top cloud, through the dragons head, to the bottom cloud. I did the same thing with another string; attaching it through the back of the dragon's leg. This allowed the dragon to stay centered but freely move side to side in a flying motion. While everything was still turned over, I added double sided foam tape and adhered it to the front panel. I added the foam tape to the dragon as well, but I didn't adhere it to the front. I kept the backing of the tape on so that it could move around on the paper. Lastly, I placed the cloud with the stamped sentiment and adhered it to the bottom cloud. I also adhered the front panel to the card base. For my second card I used the super adorable stamp set, Somebunny I Love . For this card I wanted to create a dreamy scene with the sweet bunny sleeping on top of a white puffy cloud, set in a backdrop of shiny stars. First, I stamped the images with Black Licorice Hybrid Ink and colored them with copic makers. I fussy cut the bear and bunny image. I trimmed off the bed so that the bunny looks like he's sleeping on top of the cloud. To create my front panel I used the largest Die-namics Stitched Rectangle to die cut two white cardstocks. On one of them I inked the background with distress inks in wilted violet, blueprint sketch and black. Then I used cut cardstock, die cutting it with Die-namics Stars in the SkyHorizontal. Afterwards, I added some white dots to the front using Uni ball white gel pen. I also added stickles glitter glue to the inside of the stars. This added a lot of shine to the stars. With the other cut cardstock I used the BG Roses all Background Stamp and stamped it using versamark and heat embossed in white. Next I used the embossed cardstock to die cut two clouds with Die-namic Stitched Cloud Edges . I wanted to give the clouds some texture and I love the way it turned out. I adhered the larger cloud using the foam tape to the front panel, then adhered the smaller cloud. Next I added the cut images to the top of the card. For the sentiment I used the large strip die from Blueprints 27 to die cut black cardstock. Then I heat embossed the sentiment in white, adhering it using foam tape. Lastly I attached the front panel to the card base. I absolutely adore the BB Our Story stamp set. My two children are the biggest bookworms, and I knew I had to have this set. 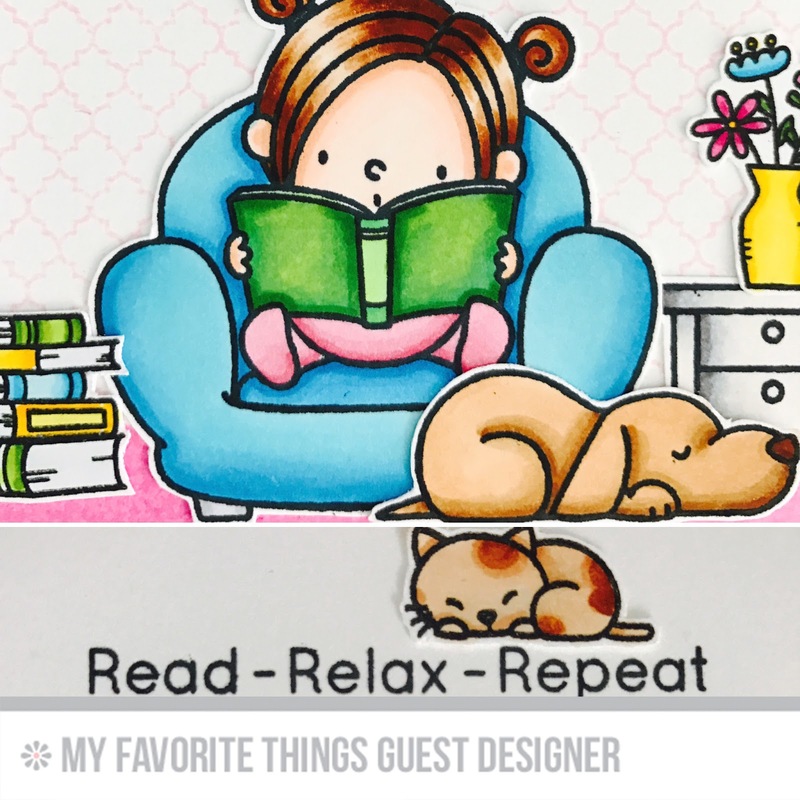 The scene I created for my third card reminds me of my daughter, who can stay up all night to read if she could. First I stamped the images using the Black Licorice Hybrid Ink and colored them in with copic markers. Next, I die cut 2 white cardstock using the largest Die-namics Stitched Rectangle. To create the front panel, I stamped the background using the BG Moroccan Lattice with tattered rose distress ink. Leaving about inch on the bottom, I covered the top using masking tape and blended the bottom with picked raspberry to create the floor for the the images. Then, I used the Die-namics Window to create the window. Using the second cut cardstock, I die cut the stars using Die-namics Stars in the Sky-Horizontal and inked the background using the distress inks mermaid lagoon and blueprint sketch. Then I placed it behind the front panel and added stickles glitter glue to the inside the stars, adding shine. Finally, I adhered all the images to the front panel and adhered that to the card base. I added the sentiment inside the card with a little cute cat. Thank you for joining me today! I hope I have inspired you in some way. Working with MFT products always brings me so much joy, and I'm happy I was able to share my cards with you today. See you again next Tuesday! Happy crafting and have an awesome day!! !